For this EP, we have deliver a techno tracks power full. 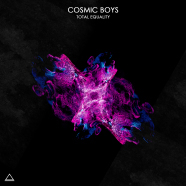 The first track Total Equality is a massive track with fat kick, electro leads and deep vocal. The second track Rossignol is progressif with a cosmic melody and space synth. We worked on a base more techno with the BPM more elevate always with our dynamic style. He was important for us to evoluate in this direction because the electronic music change every times :). We have always the same inspiration in the studio, we start a track kick bass and drum and the soul of the track arrive after. On the other hand it’s different for our Live-Set, we are very hard on the selection of our playlist and actually we play more techno and it’s naturaly that our production follow in this universe. It’s a very good evolution for us. Berghain for us because it’s a model for the electronic music. In this club it’s possible to play a long set with lot of style of techno and it’s a legend.